What actually is good exceptional and exclusive occasional speaking? Above all, there has to be a clear connection with the unique purpose of the occasion. lso the special occasional speech topics have to be both informational and persuasive. And third, share your thoughts for a better understanding of the goal and the context of the upcoming event. No need to emphasize that you have to be fully aware of your audience. The key to find the right special speech topics is addressing five W’s and one H. Ask what, why, to whom, when, where, and how long. I will discuss these questions below. 1. Why? What is the purpose of the event? 2. Do you want to celebrate or praise? What is the purpose of the meeting, event, conference or ceremony? What are the demands and wishes regarding your special occasional speech topics? Are there special requirements related to the singularity of the event? What was the first thing that comes into your mind when you were invited? Are you invited because of your expertise or professional abilities? What do you know about the character and ambiance? Why did you accept the honor to be public speaker? What do you want your public to remember, consider, support or believe in? That’s the special purpose of this public speaking assignment, your specific topic statement. To conclude: what’s the purpose? Before you determine specific aims, first determine the general goal of your special occasional speech topics. Do you want to entertain or amuse, roasts and toasts perhaps? An after dinner speaker tries to ridicule the listeners by spoofing persons or to exaggerate familair situations. Ask yourself: who or what is being honored or set in a positive light? Why? Accomplishments? If it’s a person: how does the life and works of this person influence other people? Tribute speech topics stimulate and strengthen the audiences’ sentiments of adoration and excitement. Share joy over someone’s character, or over successes at the beginning or completion of a project or season. Other input to celebrate or praise can be developed for weddings, birthdays, and roasts and toasts. Commemorative orals honor and strengthen the values of a person, group, institution, place, event, idea or subject. Focus on the values of life and past, present, and future of society. The special occasion speech topics have to be symbolic. Eulogies honor a deceased person and praise the person’s virtues and character. Tell what we learned and why we are thankful. Inspirational and motivational speakers base their talks on policy or value claims. Uplift the moral of an organization. What do you want to accomplish? How can you persuade the audience to belief, feel or think the same? This is the core of that type of occasion speech topics. With commencement special occasion topics you can offer insight and knowledge by revealing your own personal ideas and thoughts. List behavioral standards and indentify how the educational institution, company or other group could strengthen those standards. 4. Set a social agenda? Keynote speeches reinforce or establish new goals in special occasional speech topics. Set the tone and arouse enthusiastic emotions for upcoming discussions. Of course there are more other unique moments at which a bit more ceremonial special occasion speech topics are expected. E.g. introductions and announcements, vote of thanks speeches, stump speeches and events at which people are being welcomed, say farewell, retire, nominated or accept a special award. 5. Who or what do you address? What kind of organisation? In case of a celebration or honoring ceremony: who is being praised? What are her or his needs and expectations? Is it a special group competition, group discussion or special event? 6. When will you speak? Will a host introduce you and your notes? Prearrange that you don’t cover the same special occasion speech topic! Are you the only public speaker? If there are more people, then bear in mind to wake up the audience if you have for example to deliver as speaker number seven. 7. Where are you speaking? What is the ambiance, can you maintain the proper atmosphere? How big is the room? A public speakers podium? A microphone? Can you get in touch with your listeners? All very important for developing tailor-made content. 8. How long are you requested to speak? If extemporaneously, then prepare notes with some keywords. Usually, these talks are short, for instance self-introduction special occasion speeches. Occasion speech topics and ideas for a public speaking speech on birthdays, end of the year celebrations, Christmas evenings, farewell addresses and retirement speech talks. These are a few examples of special events most people hesitate to accept an invitation to speak. I help a little bit with some pleasing public speaking tips and rough ideas, accessible suggestions and general themes you can bring in. In general, stick to one single highlight of the happy birthday person. That is often enough for a small one-way chat in two or three minutes. I would recommend you keep a sharp eye on the time. Because there are other persons with other happy birthday texts perhaps. Following is a list of potential ideas for occasion speech topics. Think about a party, at the celebration dinner, even at an official ceremony or any other particular occasion you have to speak in public and need input. Aunt – List her funny habits and sayings. Or her contributions to the local community, charity or church. Brother – Tell about your interesting conversations full of keen and quick insight. and how you match perfectly with intuition. Brother in Law – Focus on his hobbies and sports activities, these are really ideal occasion speech topics, you can use them for another public speaking speech too. Daughter – Describe how she has grown up and why she is special to you. Or admire her attainments and accomplishments at high school or college. Grandfather – Mention his position as head of the family and praise his great advices and words of wisdom. Tell how he introduced you to treasures in museums when you were young. Grandmother – Let everybody know that she is a fabulous cooking queen. State that you appreciate her love and care in good and in bad times. Take you time to speak out your occasion speech topics, due to the fact that older people wants to hear everything and easily are disturbed by general noise at a birthday party. Some goes for your grandfather too of course. Or in case of a big surprise party with very noisy partygoers. Father – Emphasize he has always been – and for sure will be – your greatest supporter in life, thank him for the profitable tips he gave you, and for qualities of respect and self-esteem he taught you. Friend – Tell why she or he is special to you. Describe how you have helped each other through exams, holiday trips, parties, and so on. There are a lot of special occasion speech topics to think of when it comes to speak at a birthday celebration of a friend. Husband – Tell why he is your soulmate. Retrospect a bit, refer back to the time you were just married. Do not tend to create a complete contemplation of the past, but bring in happy memories about adventures you shared together. Mother – Express gratitude for all the things your mother did for you, your relatives and friends. Be grateful for her kindness and support in the past year. Perhaps you should thank her for babysitting for her grandkids? Think about one big thing you like to thank for. Sister – Let her know that your love for her is unconditional. Bring in a few vivid narratives about the time you were kids and played together in the playground near your home. Son – Come up with some funny anecdotes from his childhood. You could tell about the tasks in the household you have fixed together, or fishing days or the lazy nice days you spend at the cabin or cottage. Uncle – Say why you like him – his jokes? his humor? his advices, fishing trips? Mention and praise his productivity at home; his do-it-yourself efforts and achievements. Sketch why this is perfectly fitting the two of you. Close with a kiss of course! Your Own Birthday – Thank all guests for coming. Show how much they mean to you. Thank them for all birthday gifts and presents they brought in. New Year’s resolutions, a short review of the past year, look forward and reveal the things you want to do in the new year. The history of the Christmas evenings celebration, traditions, trees and decorations, carols. If you leave – Thank all for their cooperation, kindness, support, or even friendship. Wish them all the best. Use my checklists in this farewell occasion speech topics primer. If someone else is leaving – Tell that you will miss her or him. Thank for all friendship and love. The boss to an employee or client – Express thanks for the trust, loyalty and support. Find a gift that fits the future activities of the retirement and build a story around it. A colleague, boss or client to a retiring co-worker – Focus on his or her talents, achievements and successful projects. Mention some funny experiences and wonderful moments. Your own retirement – Announce what you will do from now on. Thank your boss and all colleagues for their support, lessons and friendship. Dig and find very special occasion speech topics. And do not forget to list some milestones in your career. Relate it to your audience. List the main points of the body – your main occasional thoughts on the speakers podium. List the main special occasional speech topics and construct the successes, pros and cons, values, examples, funny remarks, narratives, anecdotes or insight stories. 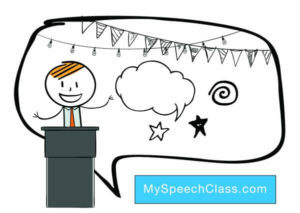 Cite this article as: Jim Peterson, "Special Occasion Speech Topics [With Setup Checklist]," in My Speech Class, May 11, 2018, http://www.myspeechclass.com/special-occasion-speech-topics.html.